So I finally shot the G17 today and it feels perfect in my hands and shoots very well too. I own a G19 which I can shoot very well on good days at 15 yards, but usually I get a couple flyers outside the 9 ring. I even shoot the G26 very well out to 25 yards with the shorter grip. 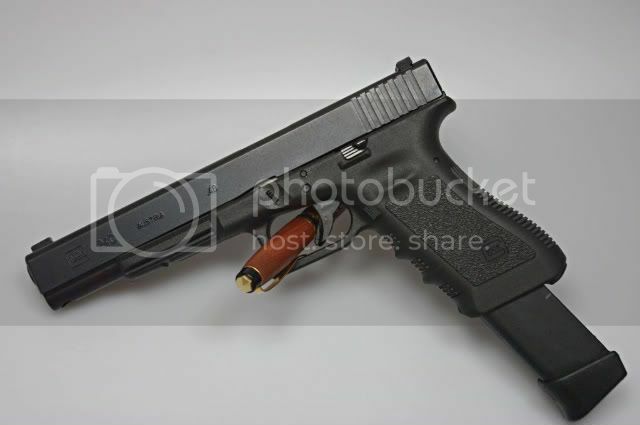 So I am pretty damn puzzled why the G19 shoots the worse out of the three and now I really want a G17. Anyone else not shoot the compact well? I don't know. I only have a 17 and I haven't shot it yet. I feel the Full size grip of the 17 helps me control the trigger better, but the 19 grip and trigger feel good as well if I take my time and focus on trigger control. I think you will do well with it but try the 19, and 26 when you can. The sub-compact shoots surprisingly well for me. Most people shoot the 21's the best. Even thoughs with small hands where the gun don't feel right to them. That will be the next gun I try out at the range next week. I give that one a try as well but at the gun store I like the G21sf better from just the feel. I'm a former Glockaholic. I had just about ever model they made in 9mm and .40. My favorite was the Glock 23C, with which I had a 9mm conversion barrel, and a Glock 32 (.357sig) barrel. Awesome gun, wish I would never have traded it for a Sig P226 Enhanced Elite. However, no matter how much I shot the Glocks, I never shot them as well as my 1911s. I still love the Glock platform, but i just shoot the 1911 better. Have you shot .40 and 9mm 1911's? I shoot my 1911 low. My Glocks are dead on. And yes, I do have an arched mainspring housing. I have owned a Glock 17, 19x2.5 (two complete guns, one upper), 23C, 24C, 26, 27, 30x2. Always wanted a 34/35. Before you get the Compact go shoot the full size at the range. Had a 19 for years, picked up a 34 a week before Sandy Hook happened. Dare I say I like shooting the 34 better than the 19? I shoot my 23 very well. I mean a G26 for ccw with 10 rounds plus a back up 17 mag and your gtg imo. Ultra full size. G34. Shot it so well it wasn't fun to shoot. Sold it for the same reason. I have found that people who can shoot a 17, don't shoot a 19 well, and vice versa. for me I don't shoot the 19 well,the swell on the lower part of the grip seems ill fit my hand. My girlfriend has a 26 which I've shot a few times and did not like. Can't aim naturally with it, and it needs to be sent to glock for extraction issues and ftfeed issues. Love my 226 navy though! Aww I see go right ahead then. That is the feeling I am getting after shoot the 19 and 17 back to back today. You guys are respond with great and funny stuff quickly. Know anyone getting rid of an Ultra Super Full Size 17L? I'd like to take one for a spin. I'd love to shoot a G34. I only have full size and subcompact, I shoot both well and full size best. I prefer my M&P40 but Glocks are fine. If it has to be a Glock, make mine a G22. Have you shot the compacts? Overall, I do best with my lightly modified 17 (Warren FO sights, Vanek GSSF trigger job, Talon Grips). I could probably do better with my similarly set-up 34, but I have a lot more time with the 17, so it is what I am confident with. I do seem to shoot PPC, and the 6-across plate rack a tad faster with the 34. I actually don't do much worse with my 26, considering it is set up for both carry and competition, with only some polish work done to an otherwise stock trigger, and night sights. My 21 is a bit odd, I must admit. It is the Glock I have the least amount of time with, and the trigger seems different from the rest. I don't know what it is, but it seems heavier and a tad longer. The recoil difference is fairly minimal, although my splits are a little slower. I don't own a 19, but shooting a stock 17 and 19 side-by-side yielded similar results for me. LOL I have not shot the 21 yet. How do you like the 26 or 27? I shoot a Smith & Wesson 64-3 4" Glock, and a Beretta M9A1 Glock.